Today I get to tell you who is the winner in the drawing for the gift cards. I’ll tell you at the end of this post. 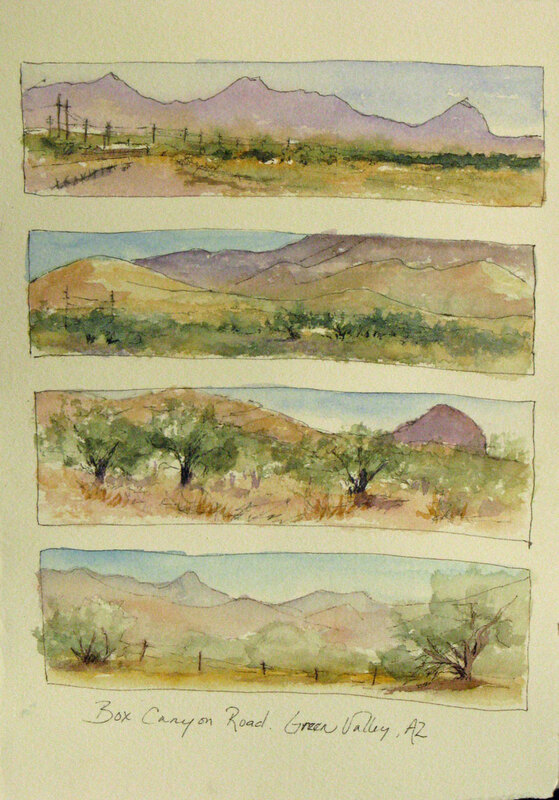 I promised more sketches from my sketchbook of our time in Arizona. We had such a grand time there. So warm and sunny. Here you go! Inside this building is the wonderful smell of leather, horse sweat and dust. I took two sketchbooks with me to Arizona. One is a sweet little 5″ x 5″ hardbound one made by Hand Book. I like it because it is small and there is the option of painting on one page in a square format or horizontal in 5″ x 10″. This is two pages. I might fill in the blank space with something like a harness or a bit…who knows? 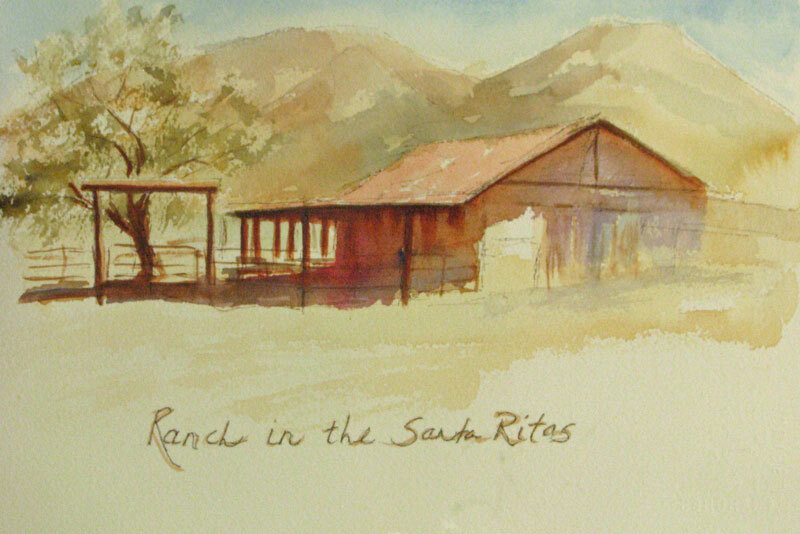 Little sketches from the ranch in the “Hand Book”. Crimson Bottle Brush bloom. I really like to paint across the page. And the winner of the box of gift cards is…..Peggy Saunders! I love random.com ! Peggy, you may email me at suziepaints at Yahoo dot com and send me your address and I’ll pop them right in the mail. Next post will be more Arizona sketches. I’m remembering the sunshine during these cold, dark Alaska winter days. The online sketch group I’ve joined is full of the most talented people! It has been exciting to see how people fill a page and the possibilities of paper, marker, and a little paint. 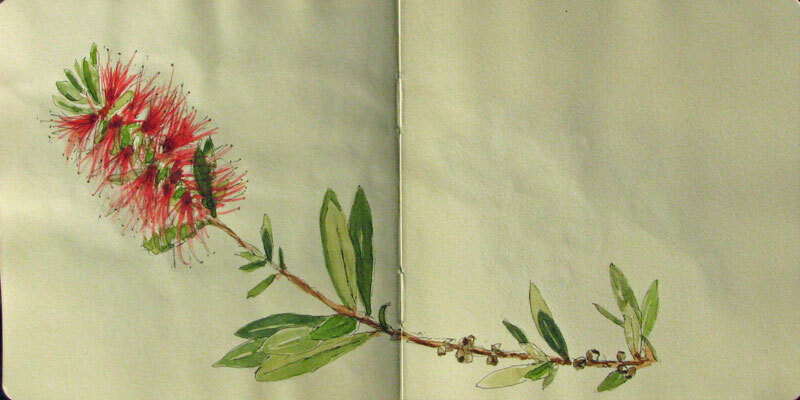 I’ve seen beautiful letters and exquisite drawings. I’m trying to learn how to design pages in my sketchbook to include words. Letters aren’t easy. A mountain or a tree can have an extra line and it isn’t noticed, but letters aren’t as forgiving. And I’m not going to show you those pages in my sketchbook. Last night I was hungry for a muffin. Not just any muffin. I wanted the muffin I had in Auckland, New Zealand on our vacation last year. It was full of cheese, spinach and fresh tomatoes. Oh, it was so good with that latte! This muffin is close, and it is only missing the vacation ingredient. 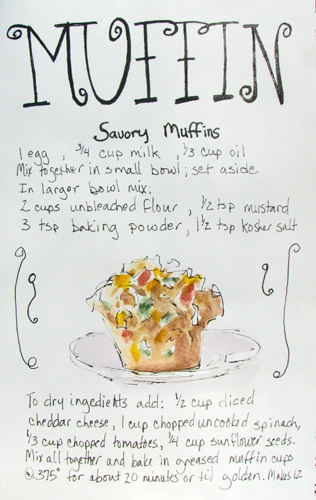 I’m going to post the recipe below in case you can’t read the letters from my sketch.